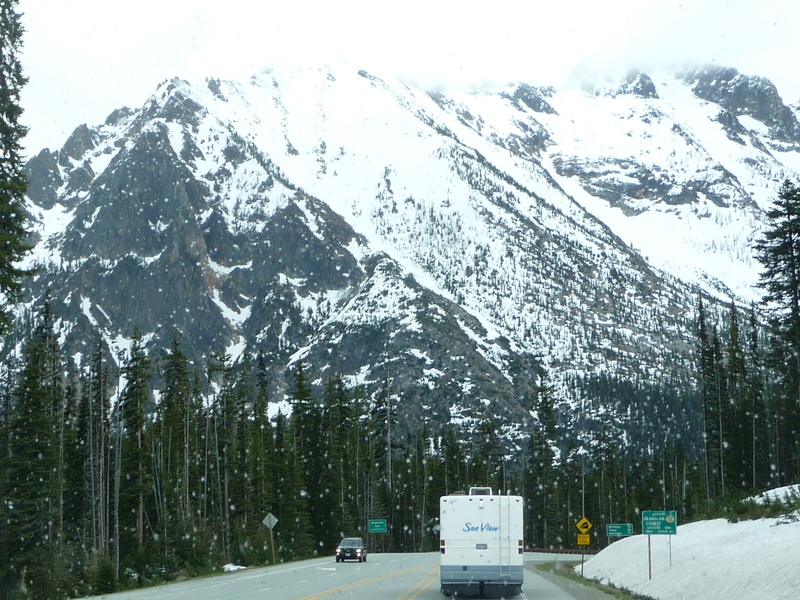 We went over “Rainy Pass” which is 4,800 feet high and as you can see from the photo on the right, there is still plenty of snow up there! 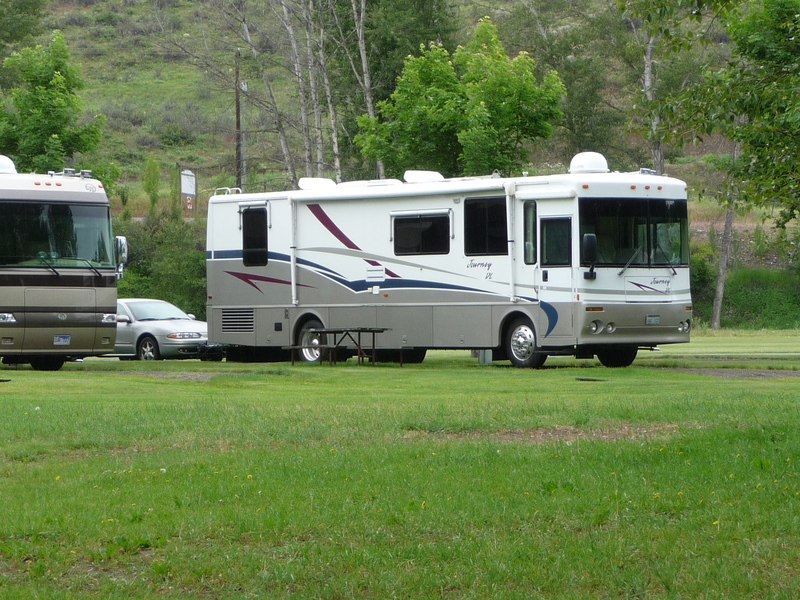 This was also the first test of the motor home, going up some pretty steep grades. Yup, we slowed down a bit, but all was well. Coming down the other side was another test for the wondrous exhaust brake (jake brake). It worked great. Tomorrow, we’re off for Coeur D’alene Idaho and we can’t help but hope for a bit of sunshine along the way. So far, very little luck in our quest for something other than sunshine in the liquid variety. Thanks to our neighbor Susan for the cute little book she gave us to record our mileage and gas ups. Thanks also to our other neighbor Karen who is watching our precious Jinx. 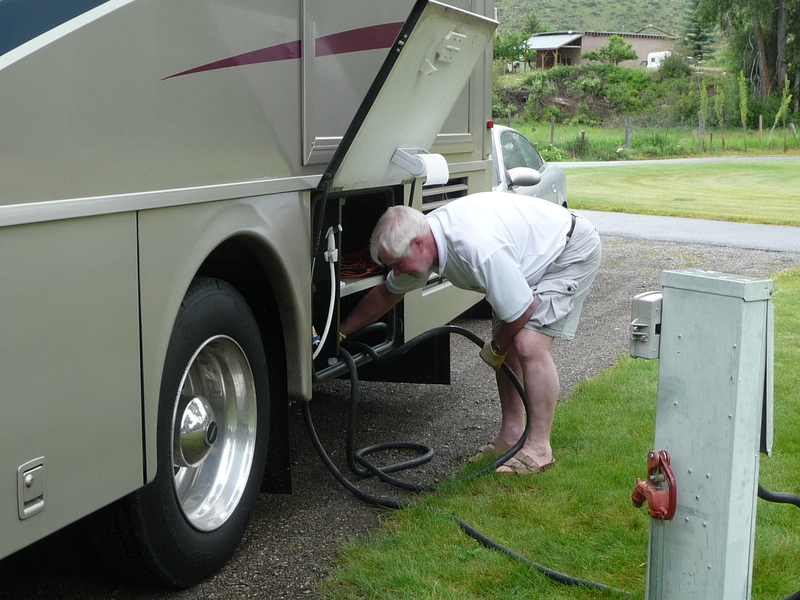 Thanks to our friend Howard who gave John the hint to bring our own squeegee for washing the motorhome windshield – we’ve already used it! More soon from John and Suz, traveling in “the mousetrap”. 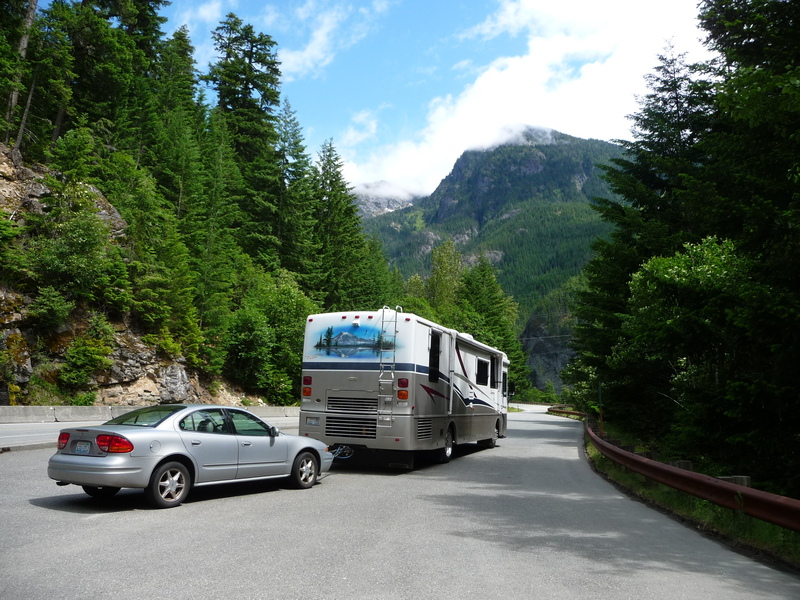 This entry was posted in Winnebago Journey and tagged Motor home, North Cascades Highway, road trip, Winnebago. Bookmark the permalink. Ta-dah! Day one safely logged. Just wondering why there was no ‘MGD’ on the power post while Johnny was hooking things up? Keep safe and take your time. And we’re off!! Glad to hear day one got off without a hitch. I imagine its a bit different from the old Custom Coach or Prowler days eh dad!